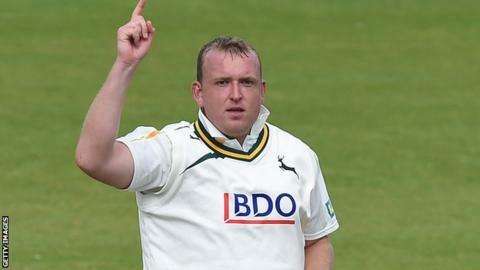 Surrey have signed Nottinghamshire seam bowler Luke Fletcher on a three-match loan deal. The 26-year-old will be available to play in Surrey's County Championship matches against Northants, Kent and Glamorgan in the next four weeks. Fletcher will still be able to play for Notts in the T20 Blast. A former England Under-19 international, Fletcher's sole first-team appearance this season came against Loughborough MCCU in April. Surrey director of cricket Alec Stewart said that with Tom Curran, Matthew Dunn and Stuart Meaker their only fit seamers, the county "needed some reinforcement". "[We have] a very heavy workload over the next few weeks," Stewart said. "I am very grateful to Mick Newell at Nottinghamshire who has allowed us to have Luke on loan." Fletcher has taken 203 first-class wickets at an average of 29.38 in 66 appearances for Nottinghamshire.